At the moment, the change is mostly a rebranding that will take place "over the coming weeks," Google indicated in a blog post. People will see a "G Pay" logo appear in Android apps, on websites, and at retail checkouts. Some services that have already made the transition include Airbnb, Dice, Fandango, HungryHouse, and Instacart. 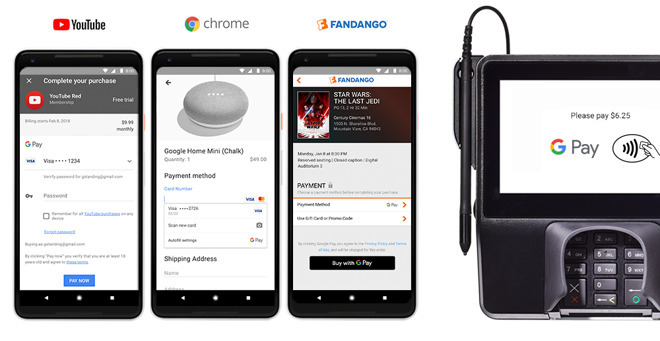 The rebranding is "just the first step" for Google Pay, according to Google's VP of product management for payments, Pali Bhat. The company is presumably looking to consolidate its position —and raise awareness —in the face of Apple Pay. While Apple is still working to get more U.S. merchants, most domestic banks and credit unions have signed on, and the platform is continuing to expand overseas. Apple Pay has always had unified branding, but initially launched just for the iPhone 6 and 6 Plus in Oct. 2014. Since then it has come to iPads, Macs, other iPhones, and the Apple Watch.